2020 will depart Ft Lauderdale, FL for Aruba, Bonaire, & Curacao! The March 2016 cruise theme is time travel to help more reenactors attend who do not have 7+ days or SteamPunk clothes. Apparently some guests cannot see these links so you can just type XXXXXXX.COM if you do not see the hotlink above. The 4th Annual SteamPunk Cruise will probably have more time periods represented. I understand that some returning cruisers (it is a very good sign when so many of us return) are working on Regency and DieselPunk among other things. Western, ACW, Boer, and Edwardian folks barely have to try. Although some details of the 4th Annual SteamPunk Cruise have not been finalized this far out there are tentative plans for a "military uniform day" and the Hugo authoress http://maryrobinettekowal.com/ offered to host two costume competitions. One for linen (Regency?) and one for costumes made for curtains. One of the high points of the SteamPunk Cruise will be the high tea at the 18th century Good Hope plantation: http://insidejourneys.com/good-hope-great-house-plantation/ As an 18th century reenactor I have seen some marvelous period houses but this is unique and ingenious. There is also a zipline for those less tea inclined. The Elissa in Galveston harbor. March 19, 2017 leaving out of Galveston, TX for Honduras, Belize, and Mexico. PM for event code before booking. The "holding cruise" to allow early discounted reservations will Be March 2018 to St Kitts and St Thomas but when available we hope to change to Havana, CUBA out of Florida. We appear to have found our Cuba cruise. We depart out of Fort Lauderdale, FL on March 12th for Key West, Havana, and Nassau, Bahamas. Fares start at just $519.00 each. 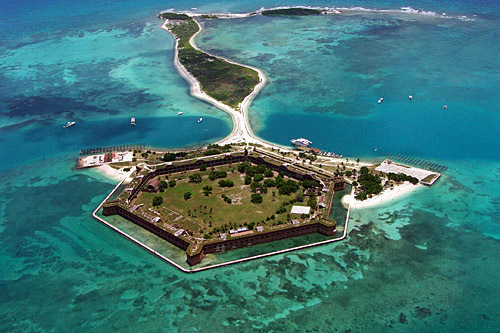 Key West has two forts to visit.